Over many years, some questions are asked with great frequency. Hopefully this page will help provide answers to the most common questions we receive here at Rocky Mountain Rawhide. Please scroll down the page for the answers. Your puppies are not as expensive as others. Why are your bulldogges less expensive? What is the difference between dogs and dogges? Do you X-ray your puppies’ hips? My bulldogge has very itchy skin. What can I do for him? How do you Pronounce ‘Bulldogge’? What should I feed my dogge? How early can you ship our puppy. Do you ship overseas? When do I spay or neuter my Bulldogge? Are bulldogges good with children? Q) Your puppies are not as expensive as others. Why are your bulldogges less expensive? A) Since we do not believe in creating more dogs that need “C” sections in order to have puppies we have selectively bred out that aspect over the many years that we have been breeding bulldogs. Statistically, 96% of bulldogs have to have “C” sections in order to give birth or the mother dog will die. We are part of the 4% whose dogs never need “C” sections. Therefore, we don’t have to tack on that $2500 to $4500 expense on each litter. The result is less expensive puppies AND a much more ethical (in my opinion) breeding program. This picture (ABOVE) of three bulldogges belonging to the same family is a great answer for that question. “Shelby”, a petite Olde French Bulldogge, 6 months old. A bulldog is a breed of dog recognized by the American Kennel Club. They are sometimes referred to as the “English” bulldog but the correct reference according to the American Kennel Club is just, “bulldog”. The French bulldog is another breed of dog also recognized by the American Kennel Club. The Olde English Bulldogge and the Olde French Bulldogge are different breeds similar to their AKC cousins, but not the same. Neither the Olde English nor the Olde French are breeds recognized by the American Kennel Club. 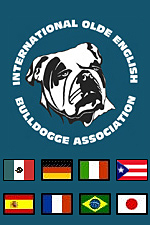 They are, however, recognized by many other kennel clubs; the National Bulldogge Association, the International Olde English Bulldogge Association, and the World Bulldog Alliance, to name a few. The origin of the Olde English and Olde French are from the roots of the AKC breeds from which they are named, but the new breeds have been developed to be much healthier, much more versatile, and with fewer problems than the AKC dogs. The AKC dogs can not breathe easily in hot weather, can not breed naturally, and can not usually whelp (give birth) without Caesarean surgery. The same is not true for the Olde English and Olde French. These breeds do much better in hot weather, are able to conceive and whelp naturally, and are usually much healthier than the AKC versions. Breeders of the problematic AKC bulldog have created a dog completely unsuitable for its original purpose – livestock catching. They have created a caricature of a dog. A cartoon character. Not something that could ever exist without artificial insemination, and Caesarean surgery. A breed of dog with an average life expectancy of only 8 years. The breeders of the many varieties of bulldogges have taken the AKC bulldog and improved it’s health, lengthened its muzzle, strengthened its heart and gave it a longer life expectancy – 12 to 13 years. There is nothing wrong with wanting an AKC French bulldog. A well-bred French bulldog is cute, sweet, loyal, funny, and great with kids . They are fun to be around and easy to love. But even a well-bred AKC French bulldog has a short life expectancy and may have many health issues. The Olde French is a better alternative – just as cute, just as sweet, just as loyal, funny and good with kids. But, also usually healthier, less expensive, and much longer-lived. “Do you X-ray your puppies’ hips”? Hospital take radiographs of Cleopatra’s hips as part of her genetic testing. No. Radiographs on growing puppies are almost meaningless. Diagnostic radiographs can be done on older puppies if a puppy shows problems or deformity, but radiographs on young puppies will not distinguish a potentially dysplastic puppy from a healthy puppy. Instead, radiographs are performed on the parent dogs at or after the parent dog’s second birthday. These films can then be reviewed by impartial persons to determine if the parent dogs have “good”, “fair”, “poor”, or in rare cases, “excellent” hips. There is a procedure called “Penn Hip Certification” that can judge a puppy’s hips as early as 4 months. However, at this time it is cost prohibitive for the average person. PennHip Certication is currently about $550, compared to preliminary radiographs which cost around $260. Both procedures can tell if a puppy may be prone to hip dysplasia but not until the puppy has achieved a little age. There is currently no way to determine hip dysplasia in infant (under 12 weeks old) puppies. The most common question I have received over the years is in regard to skin problems and bulldogs. Although Rocky Mountain Rawhide bulldogges are less prone than most to having allergies, they do sometimes show up. And, because my web site is viewed by thousands of people from all over the world – I get a fairly high volume of emails regarding bulldogs with itchie skin. I am not a veterinarian. But, I am someone with years of experience with dogs in general and bulldogs specifically. I’ve found that bulldogs can suffer from all types of allergies and are specifically prone to the type of allergies that result in skin irritation. These allergies can come in the form of bug bites (numerous raised , small lumps or welts occurring on large areas of the dog’s body), they can be inhaled, they can be ingested and they can come from contact with foreign substances. The most common bugs for allergies are fleas and mosquitoes. Dogs may also break out in welts when bitten by other bugs such as gnats, flies and ants. Since I am not a veterinarian, I can not make recommendations for treatment. However, if one of my dogs had small, raised welts all over its body I would certainly think “bug bites” and administer Benedryl at about 25 mgs per 25 pounds of dog, or 1 mg per pound. If it is an allergic reaction to bugs, the Benedryl will help within about 30 minutes. Look immediately for signs of breathing problems. If a dog is extremely allergic, swelling of the throat can cause asphyxia and death. Get your dog to a vet ASAP if breathing becomes even slightly difficult. You may not have much time. Food allergies are very common in bulldogs. The culprit is usually corn, wheat, soy, barley or beef. Feeding a grain free diet may completely solve the problem. I recommend a limited ingredient, grain free diet with something other than beef as a protein source. Signs of food allergies are: constant ear infections, sores or lumps in between toes, body odor, red, itchie or inflamed skin, tearing eyes, constant snuffling and excess gas. Another allergic reaction can come from just walking through the back yard. Some bulldogs are allergic to grass. The solution? Get rid of the grass. Dogs can also suffer from hay fever. Itchie, watery eyes, running nose and loud breathing. Cut back the weeds and pollen producing shrubs and see if it helps. Pine scented floor cleaners, harsh disinfectants and any cleaning agent that isn’t thoroughly rinsed away should also be suspected if a dog breaks out in red, inflamed skin wherever the skin touches the ground. Get rid of all harsh cleaning agents, wash the carpet with mild detergent and keep the affected off of the grass. Sometimes you have to throw the book at an allergy before you see results. Change the food to a no grain diet. Clean with natural, mild cleaning agents, and keep Fido off of the grass. At the same time, bathe him in a mild skin-soothing dog shampoo to remove contact allergens, give him plenty of Omega 3 in the form of fish oil caps (dosage to be determined by your veterinarian) and cross your fingers. It may take 3 to 6 weeks before you see results. Very simple. It is pronounced, “bulldog”. Often times, people who have allergic reactions to dogs are not as allergic to Olde Bulldogges. However, before committing to a puppy, make sure you’re one of these people! Because the Olde Bulldogge has only one type of hair (instead of two or three, like most dogs) they shed less. They are very easy to keep clean and most, with an early and frequent start, accept baths and bathing without a problem I happen to be one of those people who is allergic to some dogs but not my bulldogges. I can’t be in the same room with a German Shepherd (a breed I love), yet I can live with five bulldogges without a problem. And, yes, they’re in the house, on the couch, etc. I do four things that I think make the difference. I feed a high quality, grain-free dog food which promotes a healthy coat. It really does make a HUGE difference in the quality of a dog’s coat and I recommend it to anyone with dogs and allergies. (Regardless if the allergy is the owner’s or the dog’s. It works both ways). Another thing I do is put an egg yolk in their food everyday. No whites, just yolk. Egg whites may interfere with the absorption of certain nutrients, so we stick to just the yolk. And, finally, I give LOTS of baths. And I vacuum A LOT. Only in very warm climates can bulldogges live out side. Generally speaking, if you are comfortable in jeans and a “t” shirt, your bulldogge is probably warm enough. If you need a sweater to go outside, your bulldogge can’t live out there. They have only one type of hair, not two or three like most other breeds, and it’s very short. They get cold very easily. Also, they are much too people oriented to be outside all the time. They need human companionship, and lots of it. “Outside” bulldogges become fearful, unruly, and unpredictable. Don’t do it to them. With so many choices in dog foods, it’s no wonder people don’t know what to feed their bulldogge! To answer this question, let’s look at basic canine physiology. A dog is a carnivore. This means that although a dog can eat and digest carbohydrates in the form of fruits, grains and vegetables, it can not do so easily. A dog’s digestive system is designed to digest meat, bones, hide and the stomach contents of prey animals. A dog’s digestive system processes food quickly – usually, 12 to 24 hours. This is compared to humans, who are omnivores. Our system takes about 24 to 36 hours to digest a meal. After gorging on a meal, a dog is ready to eat again fairly soon. Humans are grazers, eating a handful here, a handful there, with our digestive system taking all the time it needs to digest the complex carbs that are an everyday staple of the omnivore’s diet. Although the dog food companies would like for the dog-owning public to believe that complex carbs such as grains and vegetables are good for dogs, the reality is that these hard to digest foods are just that – hard to digest. Sometimes too hard to digest for the dog’s simple and quick digestive system. What happens when you feed a dog complex carbs? Not much, actually. Meaning that the dog simply doesn’t digest these complex grains and all the good nutrients that they contain. They just pass through the dog’s system and your wallet without doing a lot of good. With this in mind, what should a dog eat? Ideally, you will feed your dog a limited ingredient, fully-balanced, grain-free dog food. However, this is simply not feasible for the average person. Grains are a cheap protein source for dog foods. This is why the average dog food has one or more grains as the first ingredient. But many dogs don’t do well with grain in their diet. Some dogs are very allergic to grains. So what can you do? The least expensive, hassle-free alternative to your dog eating fresh, whole organisms like rabbits and rodents are to feed a grain- free dry dog food. I do know people who cook for their dogs and their dogs do very well. But getting all the nutrients in order and in the right quantities is difficult and I don’t recommend trying it unless you have a lot of time to devote to preparing your dog’s meals. It takes hours every day. If time and money prohibit both cooking and grain-free foods then try the limited ingredient dry dog foods with only one grain such as rice or oats . This is the compromise we have come up with at Rocky Mountain Rawhide and it works very well with our dogs. Try to stay away from corn, as many dogs seem to have difficulty digesting it. If you are feeding the best quality food you can afford and your dog still has itchy skin, runny eyes, emits clouds of gas and has chronic ear infections and sores in between the toes, look at the list of ingredients on the food you are feeding and switch to something else. It sometimes takes several weeks before results are seen. When switching dog foods, do so gradually. A dog’s simple system does not tolerate change if done too quickly. Currently, none of the major airlines accept any type of bulldog in their cargo sections. Puppies MUST be flown with a passenger, in the cabin of the plane. When raised with cats and small dogs, bulldogges will usually not be a threat to these small companion animals. However, puppies need to be taught from the very start not to be too rough with the cats or the little dogs. This is frequently accomplished by the cat and small dogs themselves and the owner should allow it. Go ahead and let Fifi and Fluffy terrorize your puppy. They have a limited amount of time in order to instill respect. Let them. Not allowing them to teach the puppy to respect these other creatures could cause problems at a later time. Bringing a puppy into a house with an established bulldogge is usually fine. Just don’t let the two play unsupervised. Bulldogges are very big and sometimes don’t pull their punches. They aren’t trying to be mean, it’s just the way they play. They play very rough with each other and might not tone it down all the time with a puppy. Don’t let them hurt the puppy, however unintentionally it may be. As far as cats are concerned, a bulldogge raised properly with cats will not be a problem should you desire to add another cat in the future. Make sure your bulldogge understands that chasing the cat is a BIG mistake and start introductions with the dog securely tied to a large, stationary piece of furniture. Recent university studies have suggested that spaying and neutering dogs too early can result in a higher incidence of both behavioral problems and ligament/joint problems. The studies have indicated a correlation specifically between early neutering of male dogs and fear aggression and early spaying/neutering of both sexes and ligament problems. In other words, males neutered too early may become untrustworthy with strangers and in unfamiliar situations and both sexes altered too early may develope the canine version of torn ACLs as the long bone in the legs grow longer after early neutering but the corresponding ligament attachments may not. When the dog reaches physical maturity the ligament may tear, causing pain, lameness and permanent disability. How early is too early? That’s a very good question. Spaying a female at 8 to 12 months of age would not be considered too early. Male dogs tend to mature more slowly. When is the optimal time to neuter your male dog? That depends on your dogge. Some breeds mature faster, others more slowly. It is a safe bet to say that neutering a male dog before 6 months of age is too early. Waiting until sexual maturity or beyond may cause unwanted behaviors to crop up and become ingrained. Neutering a dog before the testosterone-produced behaviors such as leg-lifting in the house, inter-male aggression and mounting appear on a regular basis is recommended. Neutering after the behaviors become habitual will lesson the behaviors but may not eliminate them entirely. I think that it is safe to say neuter your male dog at between 9 and 15 months or as soon as he starts to lift his leg to urinate – whichever comes first. Yes. A well-bred bulldogge should be exceptionally good with children. They are very tolerant, almost angelic in their ability to put up with the antics of small kids, and especially suited for children with a lot of energy. The bulldogge’s calm presence helps kids play nicely, and if the dogge’s feelings or dignity is too badly hurt, the bulldogge will usually just get up and leave. They will usually not retaliate with a growl or bite. I can not count the number of pictures of bulldogges in costumes we get every year from happy puppy customers whose bulldogges are the prime recipient of “dress up” time with the kids. I see bulldogges in every conceivable mode of attire, from tuxedos to belly dancer outfits, Superman to Darth Vader. Not only do the bulldogges put up with it — they seem to enjoy the whole thing. They relish the closeness of the kids and the attention a Little Mermaid costume will bring when worn by a bulldogge. Bulldogges who have never encountered children may not understand them. In this case, barking and growling may indicate confusion and fear. If this is the case, a professional trainer with kids in tow should be consulted. And of course, no dog, bulldogge or otherwise should ever be left unsupervised with small kids. Only dogges who have a history of tolerance should ever be left alone with children and then only for short periods of time and only with gentle kids who will not intentionally or accidently provoke an aggressive response from a dog.